THIS CABINET HAS NOW SOLD BUT WE CAN SOURCE AND FINISH ANOTHER VERY SIMILAR -JUST GET IN TOUCH ! 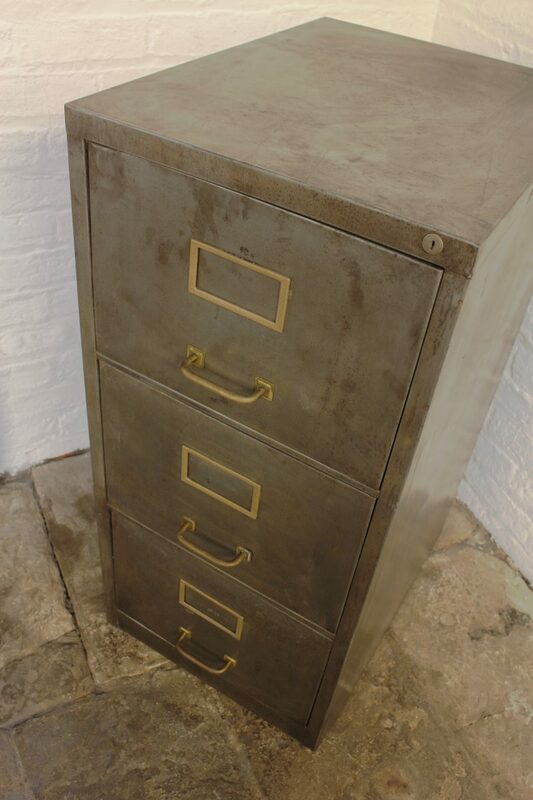 Reclaimed Vintage Urban Industrial Chic 1960s Stripped Down and Distressed Bare Steel 3 Drawer Filing Cabinet with Brass Handles and faux brass subject holders… It has a great industrial look to it with amazing patina on the hardware only achieved with time and use. … Newer options don’t have the beautiful brass work and we sell these for around £495 – we prefer to keep unstripped options outside as we don’t have room to keep stripped ones inside the workshop… please get in touch if you would like us to send you photos of unstripped stock ! This cabinet is 467mm wide x 608mm deep x 1007 high… they are all around this size but they do vary a little !